For many, the tallit often referred to as a prayer shawl, is one of the iconic symbols of Judaism. The purpose of the tallit, however, is often misunderstood. The principal purpose or function of the tallit is to serve as the four corners from which to hang the fringes in compliance with the Torah’s prescription in the book of Numbers 15:37-40. Having a bag for one’s tallit is not a reԛuirement. However, many choose to use them to help protect tallit. When you consider the many instances in which the tallit must be taken outside the home, having a place where it can remain safe becomes increasingly important. Are primarily used to store the tallit when not in use as well as to protect the tallit from wear and tear during travel. Also, many believe that it enhances the mitzvah to have a beautiful bag for the tallit to rest in. Despite tallitot being available for use at Temples many prefer to use their own, thus increasing the need for a tallit bag. Many tallitot makers will create bags to match individual tallit. Individual bags are also available for purchase separately and often have varying designs. Tallit bags can be made in a variety of fabrics, just like the tallit itself. It is very common to see velvet tallit bags, as it is a very soft material and provides extra cushioning to protect the tallit. Tallit bags are also commonly made of silk, leather, faux leather, or other fabrics. Tallit bags often embroidered with symbolic designs for adornment. Some conventional designs include the Star of David, Torah scrolls, the Ark of the Covenant, or only the word tallit (typically written in Hebrew). Also, tallit bags can be personalized in numerous ways, the most popular of which is having the Hebrew name of the wearer embroidered into the front of the bag in colorful thread. Regardless of material or design, tallit bags are importing for the care and storage of your tallit. To have a bag to protect your tallit is an act of respect for the Torah’s commandments and the tzitzit. From types of fabrics to color matching – what should you focus on when shopping for Talit and Tefillin bags? Talit and Tefillin bags are critical to keeping the prayer shawl and tefillin in good condition for years. Therefore, it is recommended to invest in high-quality Talit and Tefillin bags. The quality of the bags is measured by several parameters: the type of fabric, the quality of the embroidery and the finishing level of the sewing. The fabrics we recommend for tallit and tefillin bags are more sturdy and long-lasting, such as velvet, impala, linen, leather, and other types of woven and slightly stiff fabrics. Most of Talit and Tefillin bags made from a kind of material, which usually is a part of the overall design, but there are also cases in which different types of fabrics combined to create a unique and exciting design. Apart from the quality of the bags, there are additional parameters that you should consider when buying the bag. Because the bag is intended for long-term use, it should match the personal taste of its owner, so choose something you think you’ll appreciate even years from now. 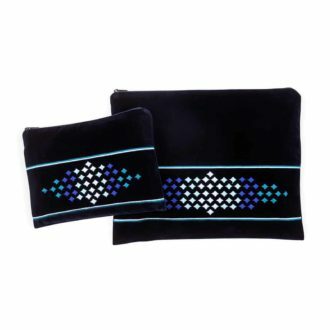 When buying a Talit and Tefillin bag, it is preferable to choose a matching set of two bags, one for Talit and the other for tefillin, designed in the same style. That way, both bags will complement each other. The last emphasis is related to where you purchase the bags. Not everywhere can you find a Judaica store available, and even if you have one nearby, not always there is time or patience to go all the way to the store for a purchase. Therefore, you should find an excellent online store that offers an online shopping option. That way, you can check out the variety of products available and order a Talit and Tefillin bags at your convenience. That said, some people will still prefer the good old fashioned way of going to a store, touching and seeing the bags before making a purchase. It is really up to you.